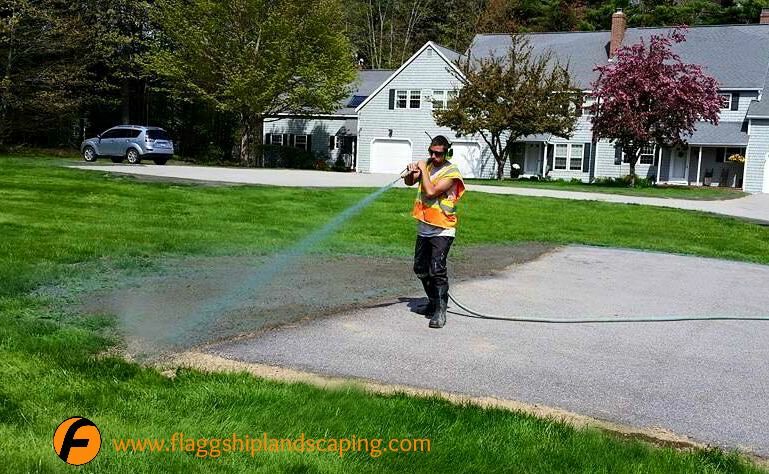 Hydroseeding in Maine - Easy and Efficient Lawn Installation - Flaggship Landscaping, Inc.
Maine has such a short summer season, and whether you just built a new home, renovated your existing lawn, or want to patch up some winter damaged areas, you are probably wondering which is the easiest, most efficient way to get a thick, lush, green lawn. We want to enjoy our lawns as long as possible, so when it comes to lawn installation, time is of the essence. Traditional use of loam, seed, and straw isn’t always the quickest or most cost effective way to go, and sod can be very expensive. This is why, when conditions are right – we highly recommend the hydroseeding process. Hydroseeding, when done correctly can save our clients time and money, and has many advantages. First, we bring in high quality screened loam. The surface is raked to create a smooth, even base. We then apply a spray that consists of water, high quality seed mix, wood fiber mulch and fertilizer. We use high quality seed blend regardless of the type of installation. The cost savings comes down to labor. With a traditional lawn installation, each material needs to be applied separately. With hydroseeding, the seed, fertilizer, mulch and water is applied at the same time – saving us time, and you money! As with any lawn installation process, proper watering is the key to successful germination. To care for your newly hydroseeded lawn, water twice daily for at least 20 minutes at a time. Always keep the soil moist – but not muddy. Never let the seed dry out – even in anticipation of rain. Within 10-14 days, grass should begin to germinate. Depending on the time of year, with continued watering, the new lawn will be ready to be cut in 3-5 weeks, or after it reaches at least 3″ of height. We recommend starting a lawn feeding program to promote healthy growth of new grass.